There are 24 different size extension ladders in the range. 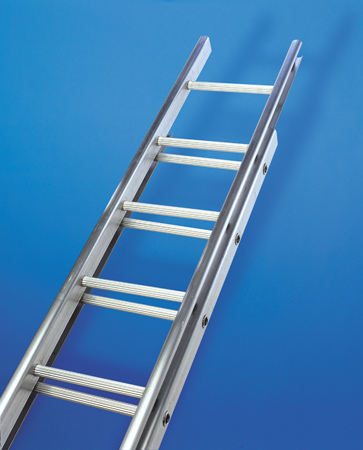 These aluminium extension ladders are available as either single section, 2 sections or 3 sections. The range of extension ladders has ’C’ section styles and ‘O’ shaped rungs making the single section ladders suitable for mounting vertically. Heavy duty ‘C’ shaped stiles with non-slip serrated round rungs. Fully Interlocking stiles for safety when extended. Can be converted to rope-operation. Once you buy one of our products listed above there are a number of other products you might want to look at – stoppers, stand-offs, stabilizers of all sorts. These items prevent ladder slip and twist and make the product safer when using.